Considered to be Asia’s most treasured spice for not only its spicy-sweet flavor, but for its therapeutic effects as well. 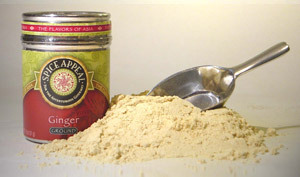 Fibrous and less pungent than its fresh version, ginger is primarily used as a savory spice in Indian, Korean, Chinese and Southeast Asian cuisines. An essential part of curry blends, stir-fries, snacks and desserts. Add a dash to hot and cold beverages such as tea. Tasty in a variety of baked goods and confections such as cakes, puddings, cookies, gingerbread, pies and ice creams. Use with Caribbean marinades, curries and stews as well.